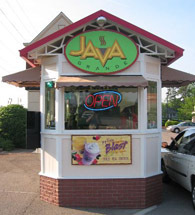 If you are looking for information on the Java Grande franchise business opportunity, Java Grande coffee franchises, Java Grande coffee drive thru franchising or Java Grande drive thru coffee franchise, then you have come to the right place. Welcome To Your New Drive Thru Coffee Business! Welcome to Java Grande. We are the leading drive thru coffee company in the US. We provide turn-key business solutions with NO ongoing royalties or fees on any kind. 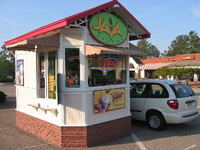 Kiosk to the right features the optional awning and brick configuration. Our Mission is to provide our clients an a profitable operating environment. We do this through site selection & zoning assistance, extensive training, and support after the sale. We also provide buildings that you can customize to your own brand.